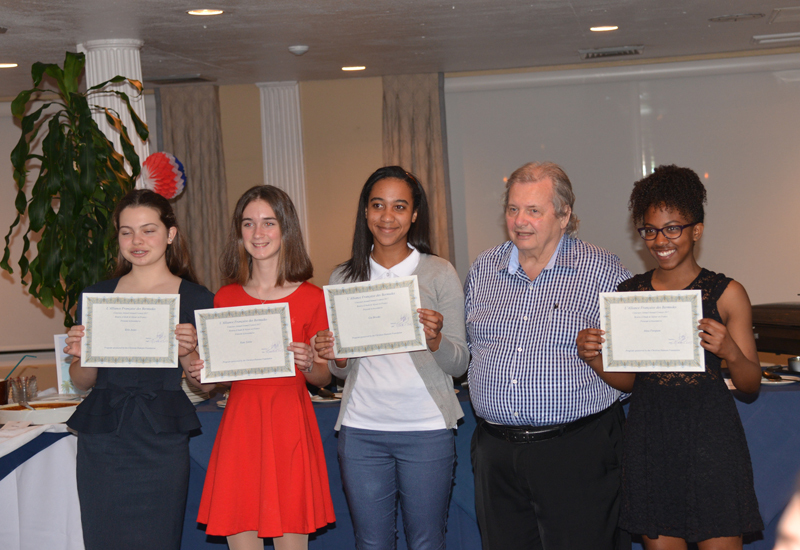 The four winners of the Concours Annuel were announced to the members of L’Alliance Francaise des Bermudes last night at the Annual Dinner celebrating New Caledonia. They were treated to a presentation by the students who travelled to France last summer for the three-week educational trip sponsored annually by L’Alliance. “Our charity was established more than 30 years ago, to promote the French language and culture. This student exchange program, generously sponsored by the Christian Humann Foundation since its inception, is our most important charitable endeavor,” explains Marc Morabito, president of the association. The winners will leave the Island early July to study French for three weeks in Cannes, on the French Riviera. L’Alliance’s members are not only from France, but from many Francophone regions and countries around the world, including Switzerland and Luxembourg, La Réunion, Le Québec and l’Acadie, Burkina Faso, and Les Iles Maurices, and many Bermudians also join in to enjoy the monthly Café Français and French cinema. L’Alliance welcomes all, French, Francophones and Francophiles, to become members, for more information please visit their website or email alliancefrancaisebda@gmail.com. Awesome!!!! Congrats to ALL of you…..Make the most out of this experience that has been offered to you!!!! La Enjoy le experience. Le soak it all in. la live, la learn , le love! La vive la France. Seriously though. I wish I had the opportunity these four have. You are all very lucky and by the smiles on your faces we can see you are grateful and know it. Thanks to those that are helping to make these opportunities happen. Give and you get back – ten fold. Tres bien fait a tous! Passez une super sejours a la cote d’azur! !